Hi everyone! I am so, so excited about today's post!! A Blog Named Hero is teaming up with Elle's Studio this month and I am over the moon happy! I love EVERYTHING by Elle's Studio. I will have much to share with all the goodness I received from them this month so make sure to check back often. Also, if you haven't read on A Blog Named Hero, I will be doing a tutorial on an altered home decor item on the 23rd of each month. For today though I have a very simple card. I am just getting my mojo back after having been down with a bad back and the flu for 3 weeks. I wanted to go CAS on this one. I wanted Elle's Studio products to shine. I used a speech bubble from Elle's Studio's Monthly Kit. I started by stamping the background with Hero Arts Tiny Inks spots stamp with the new Soft Vanilla shadow ink...I absolutely LOVE this color. It's just gorgeous in person. 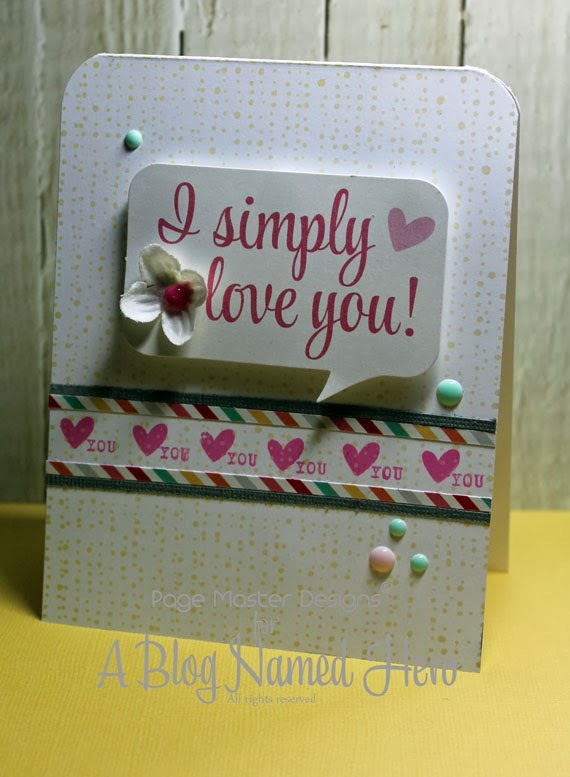 I then marked of an area to stamp the Elle's Studio "Love you More" stamp set across the bottom of the card in Hero Arts Mid-tone ink in Bubblegum. I added two small strips of paper, pop dotted the speech bubble, added embellishments and it was done. Fast and simple. Please head over to A Blog Named Hero to see what the other girls created...you won't be disappointed. Don't forget to join in the new Challenge which is "Flowers", you could win a Gift Certificate to the FABULOUS Simon Says Stamp! Then you can order this yummy line from Elle's Studio. Good luck! Love your beautifully composed card, Michelle! I love how you used the colors, flower, pattern paper and enamel dots! Thanks for stopping by my blog!